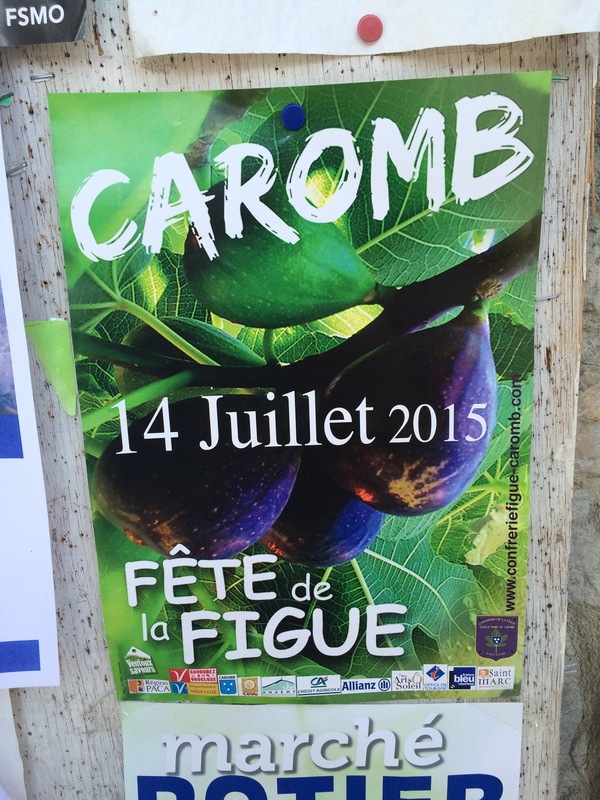 I can’t help it – I’m a sucker for a local Festival in France – so you can imagine I was delighted when, on a planned bike ride last week, we arrived in Saint Didier and noticed a sign for the Fig Festival taking place in Caromb that day. I feel I should explain that Caromb was (by quite some miles) in exactly the opposite direction to the route we had planned, but the chance of spending a couple of hours wandering around, learning more about figs and hopefully tasting some, proved too much of a draw and so we bought a map from the local Tabac and then turned left instead of right and headed out towards the village. 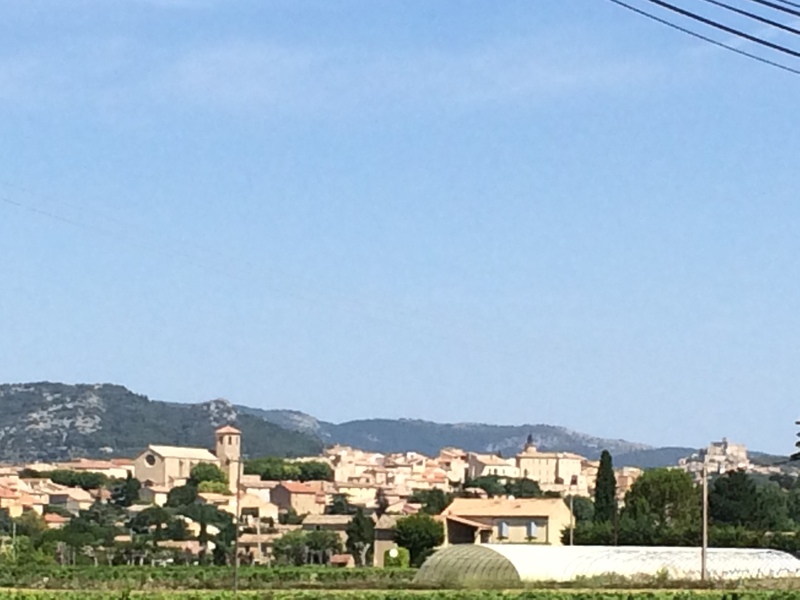 It was a lovely ride through the small town of Mazan, through vineyards towards Caromb, which sits against the backdrop of the Dentelles, with Le Barroux perched high on a spur of rock beyond. 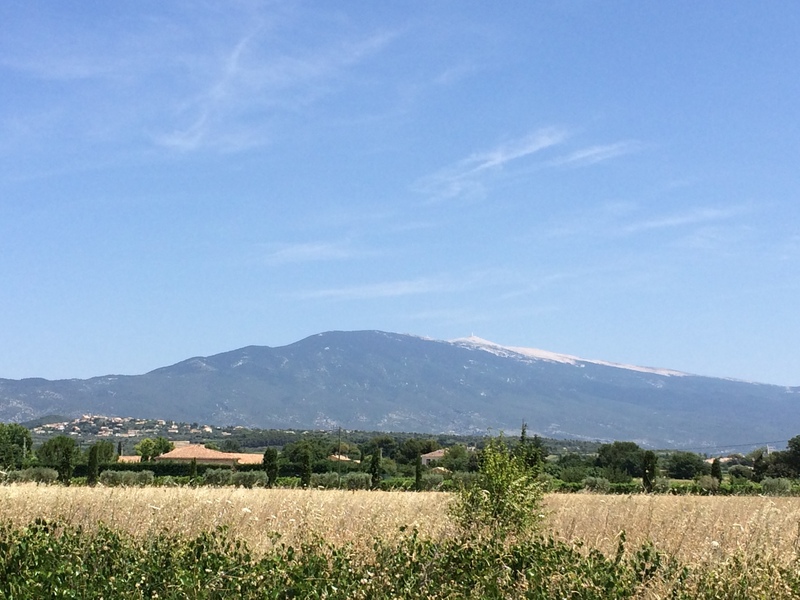 Needless to say the mass of Ventoux was ever-present on our right as we cycled along the quiet roads. When we arrived it was clear from the signs advertising a ‘navette’ to shuttle visitors in and out, that this was going to be quite an event – so we cycled through and found the Fete in full swing, taking over the main road and squares in the centre of the pretty little village. 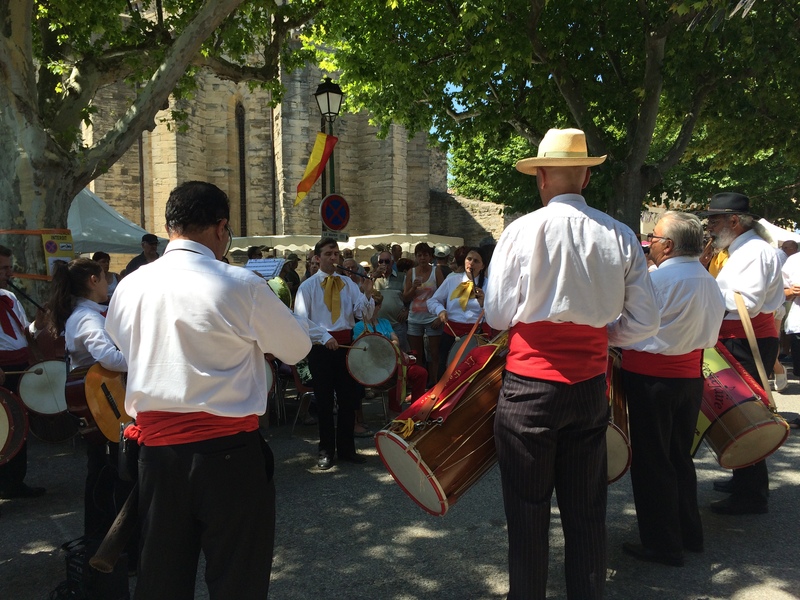 We had clearly arrived at a perfect moment as there was a parade of different groups of people, representing local producers, making its way through the streets, led by a traditional provencal band. The people in these groups were dressed in long, brightly coloured capes, with one of their members carrying a banner for their particular ‘Confrerie’ – including garlic and of course figs. It was evident from this that the Fete was an opportunity for a celebration of all local foods and traditions as well as the local figs. I must admit I love figs and can’t think of anything nicer than a simple breakfast of sun-warmed, freshly picked figs with yogurt. 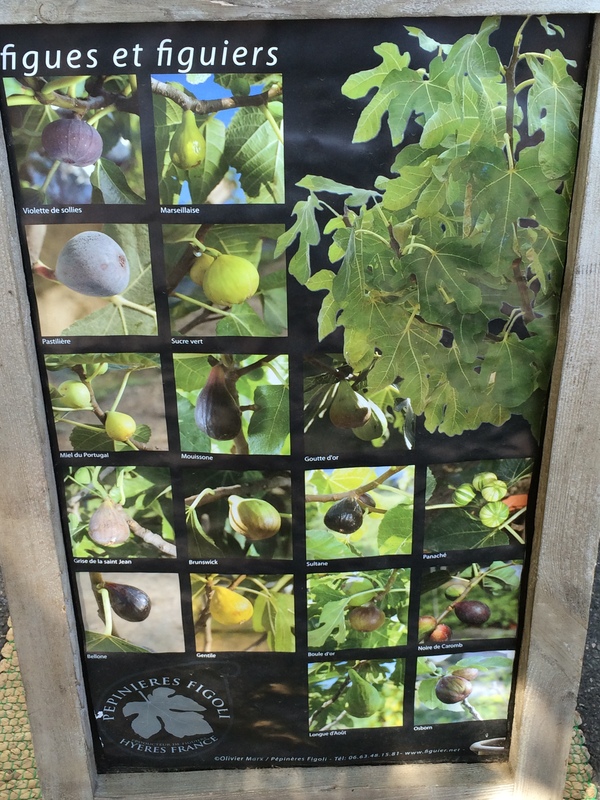 What I hadn’t realised though was the variety of figs that are grown or that Caromb had its own local fig – the ‘Noire de Caromb’, which is at its best at this time of year. Which fig is best for you? -or simply satisfy yourself by buying a tree to take home with you. 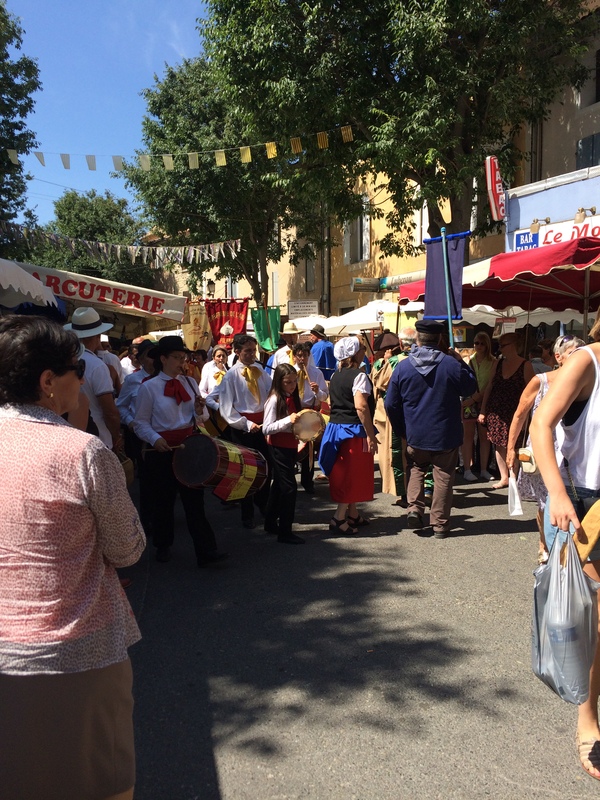 The ‘Fete’ was an absolute delight and we would have loved to have stayed for the communal lunch that was just starting in the main square – accompanied by the provencal band that had led the parade through the streets earlier. 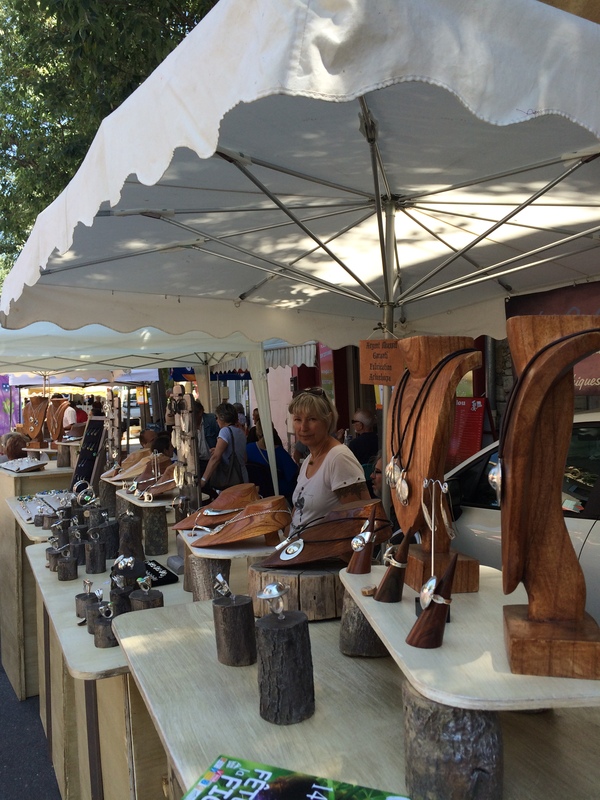 Of course, as with the other local festivals we have visited over the years, there were many other stalls selling local handicrafts, which are always lovely and Caromb was no exception. 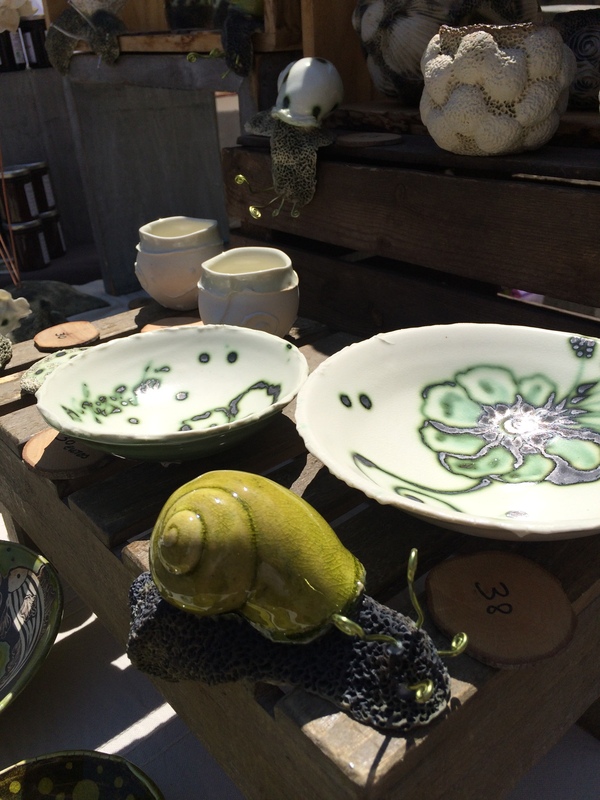 I was particularly taken by the pottery on this stall, particularly the large and rather lurid snails, which seemed ready to crawl down onto the next shelf…..
also the games made from local river pebbles…… simple but beautifully presented and a great idea…………..
there were also some nice paintings …………. As ever I was very tempted by many things, but with only having handlebar-bags on the bikes our carrying space was especially limited so we restricted ourselves to buying figs (in a variety of guises) for lunch, before moving on. It didn’t seem to be doing much to keep the sun off its face, nor did it appear to be acting as a particularly effective fly-repellant. For us it was just one of those rather ‘bizarre’ sights that helps make France what is is and to be honest we can’t wait to return. 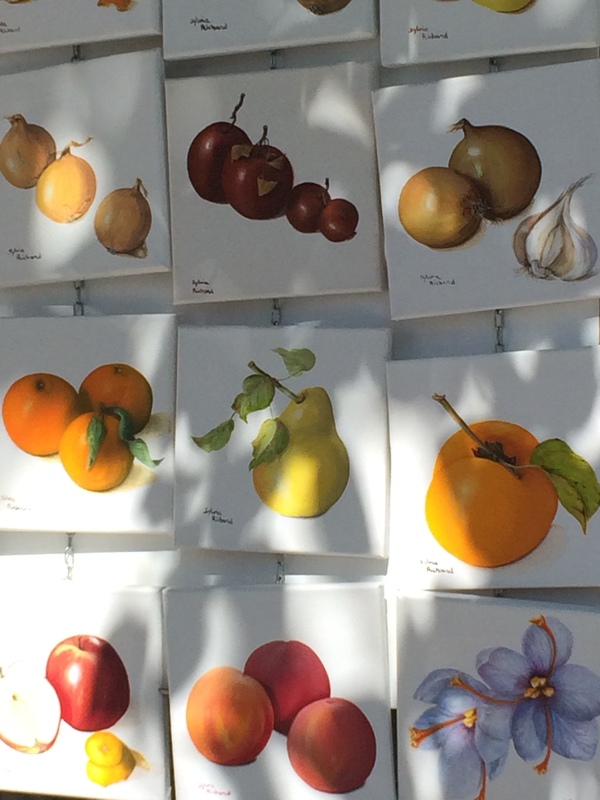 I share your love of local festivals – and whilst in the UK, County and Country Shows too – and I really enjoyed your account of the fig festival. I have to admit I was a little teary eyed though as it brought home to me again, the folly of leaving my beautiful huge fig tree behind when I moved house last year. The figs will be getting large and black and squishy and fabulously tasty right now — and someone else is enjoying them!! By the way, the flat cap looks better on the horse than on my partner Malcolm! Thanks – I’m pleased you enjoyed it – the festivals are so much fun and I too enjoy the local fetes and fairs we have here in Devon . 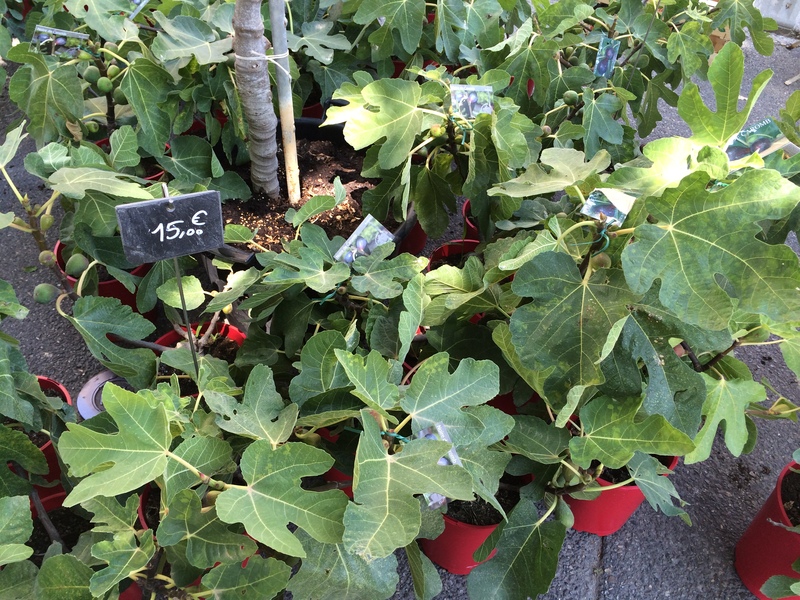 I’d love my own fig tree but sadly Dartmoor weather doesn’t give the best growing conditions – too much rain!! I love the way the French have festival for all sorts of food and drink. As you would expect in Normandy, we have seafood and cider festivals as well as a carrot festival – who would have thought the humble carrot would get it’s own festival?! I can imagine the cider festivals must be great fun – I must admit though I’ve never come across a carrot festival, I’m fascinated now ! 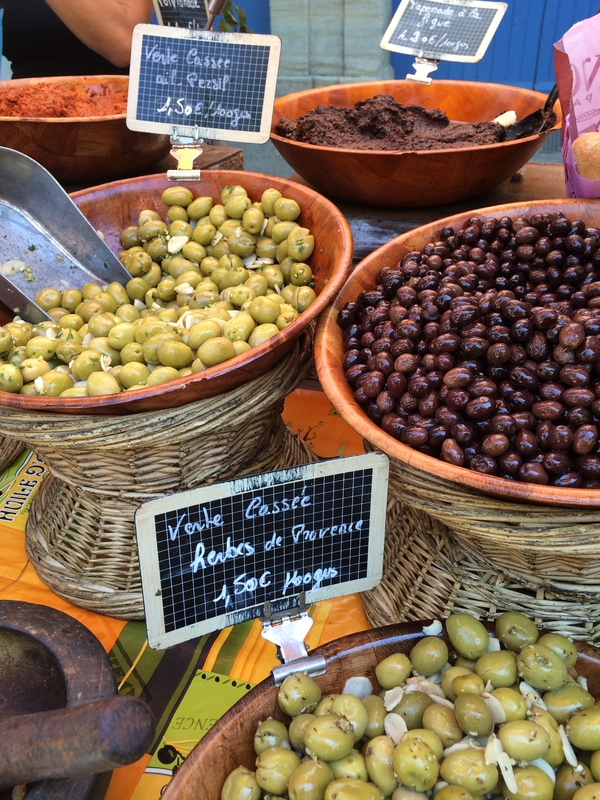 Thanks – an Avocado festival sounds good too – we’ve just stopped off at Carcassonne on our way to the Vaucluse for a couple of weeks & look forward to what we might find this time! 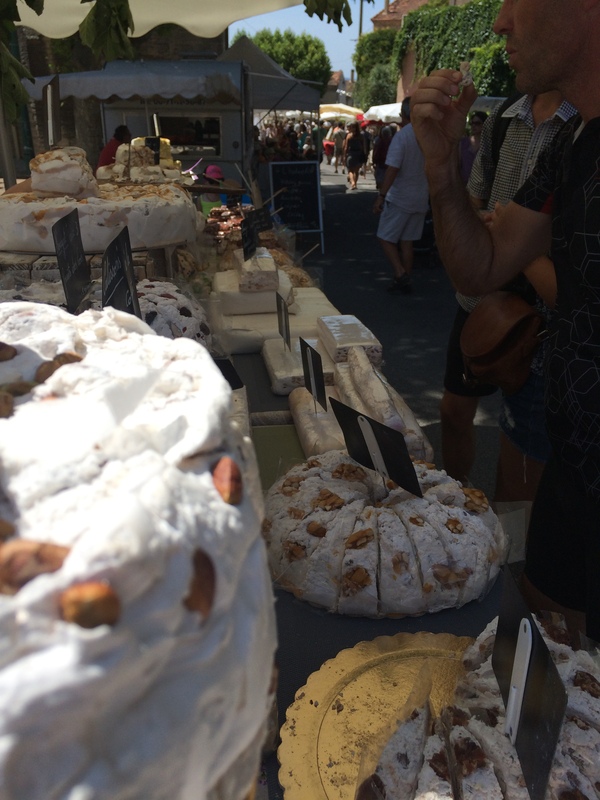 I adore figs and I love a good French village fête so this has got to be a winning combination. 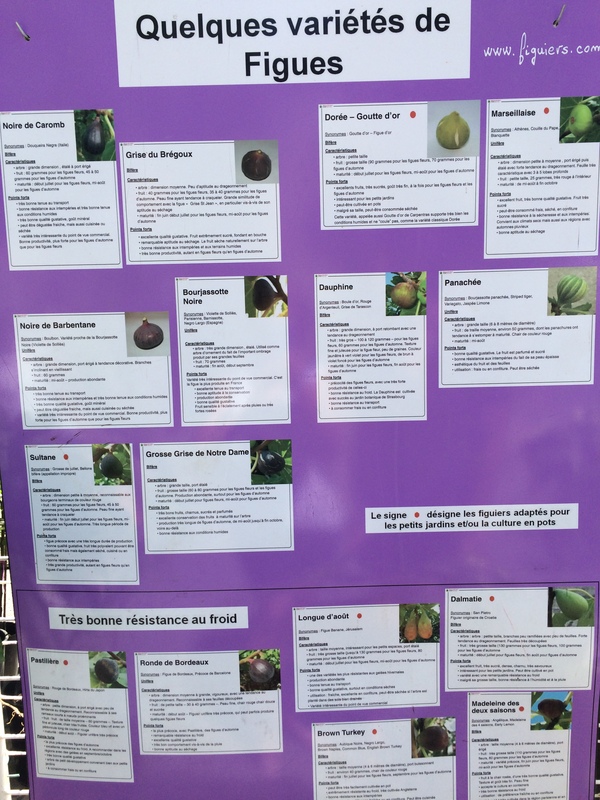 Near me one of the funniest ones is the Fête des Courges every October, but being near Grasse and the perfume industry we also get lots of flower/odorific festivals: fête des violettes, roses, mimosa, oranges and the most famous of all the citron in Menton every February. Sorry I took so long to read your addition to #allAboutFrance, the summer holidays and our big road trip rather got the better of me, but I’m just in time before the next link up this Thursday (3rd Sept)!! Hope to see you there and thanks for adding this lovely post. Thanks – the Fete des Courges sounds fascinating and I have always promised myself a trip to the Menton citrus festival after seeing it on postcards when I visited as a child – I still haven’t managed it but will do one day. We’re on the ferry at the moment just returning after nearly 3 weeks in Provence so have lots of new things to think about for the next #AllAboutFrance ! They are lovely and this one was particularly nice as it was in such a lovely village & so unexpected – the horse in the flat cap still baffles me! 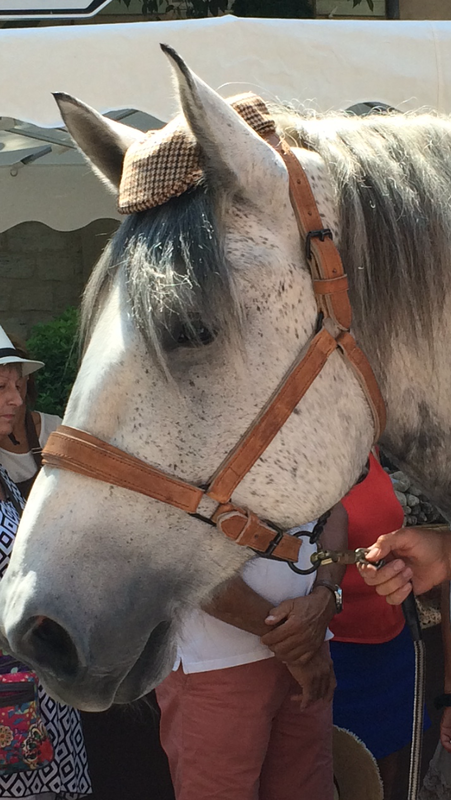 So lovely to read about this unusual food festival and the tweed cap-wearing horse taking centre stage! A great post to link up to #FarawayFiles. Thank you! Thanks – sorry to have taken a couple of days to get back to you but I’ve been en route back down to Provence for a few days. I love Figs & have always yearned for a fig tree of my own, but there’s one just down the road from our new house so I’ll be able to manage with that. 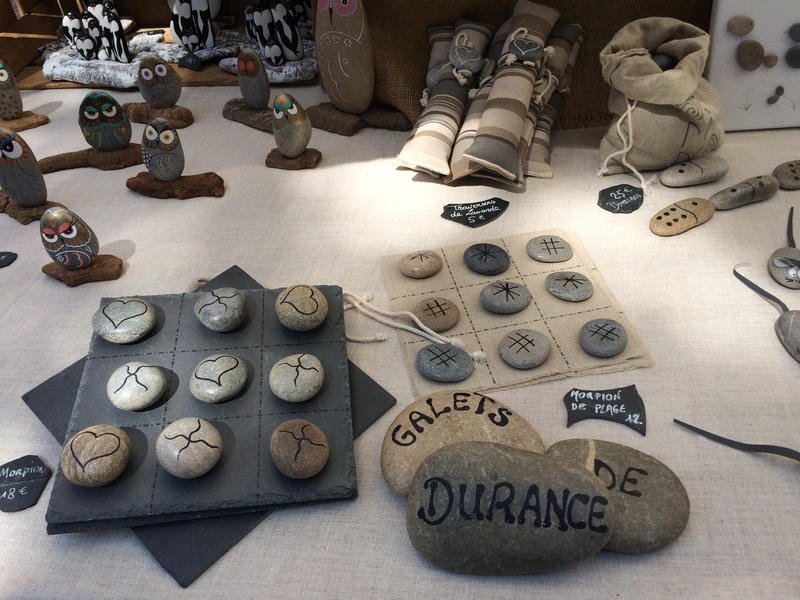 For me this is what pottering around Provence is all about and certainly worth seeking them out! Great post! I love this sort of local festival. But it’s weird – I always thought that figs were in season much later than mid-July; an early autumnal sort of fruit. It seems like this “Noire de Caromb” is a rather unusual variety. Thanks for educating me! 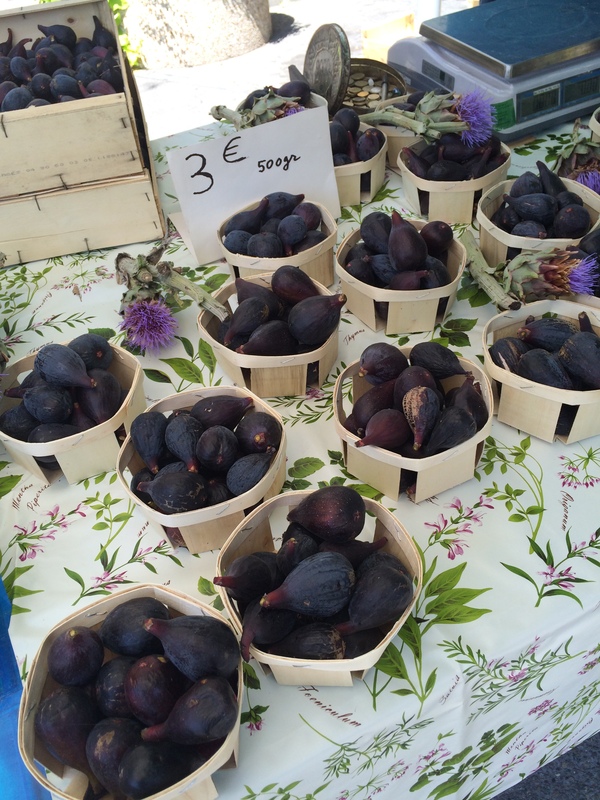 Thanks – pleased you enjoyed it – we’re over in Provence again at the moment & there’s still Figs here now – the Noire de Caromb do seem particularly early, but as a lover of Figs, that suits me fine as it just extends the eating time!! Thanks it was just good fun & a lovely find!